Many businesses have switched away from Internet Explorer in the past few years, and while Firefox is a popular tool in the corporate world, few workers exploit its full power. However, just a handful of free extensions can provide invaluable business tools. We've picked out four of the best extensions that are also free of charge. You can search for and install all of them using the Addon Manager within Firefox (From Tools select Add-ons, then click the Get Add-ons button in the window that appears). This handy plugin does just one thing. Once installed, it'll turn any currency amounts listed on a Web page into hyperlinks. When the links are clicked, a small floating window appears that can convert the amount to any other currency based on current exchange rates, with data from iforex.com. Accurately converting any currency is only a click away with Forex Currency Converter. In other words, if you're browsing a European site and are thinking of ordering a product, simply clicking the price in euros will allow you to instantly and accurately see what it is in U.S. dollars. 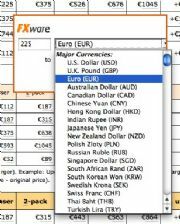 A silly irritation is that the add-on doesn't detect the currency, so you'll need to select it from a dropdown list in the pop-up window. However, the pop-up remembers what you selected last time, so if you frequently have to convert Euros to US dollars, for example, there'll be little hassle. Described as the Facebook of the business world, LinkedIn allows you to network with others in your profession. If you're a fan of the site then the official LinkedIn Companion for Firefox extension is a must. The add-on does three main things. The first is to add a button beneath the bookmarks toolbar that displays a menu, showing shortcuts to various sections of the LinkedIn Web site. It also allows you to share the Web page you're browsing on your LinkedIn profile, and tracks recently-viewed profiles. You can reach the 'Facebook of business' more quickly in Firefox. Viewing office files in Firefox can be a single-click operation with gPDF. In both cases you don't need to have a Google Docs or Zoho Office account, or be logged into them. OutWit Docs lets you use Google as a document search engine to research topics. Describing itself as a ‘document harvester', OutWit Docs is a clever little plugin that transforms Google into an office document search engine. Just click the OutWit button next to the home icon on your browser toolbar and a separate search window will open. Entering a search term in the usual search field at the top right will search Google but only return Microsoft Office, OpenOffice.org, CSV or PDF files.